We left Jackson at 8 a.m. and wound our way through the Star Valley, following the route of the Oregon Trail. We saw osprey nests, a bald eagle surveying the valley from a naked treetop, American Pelicans perched in the river, beaver dams. 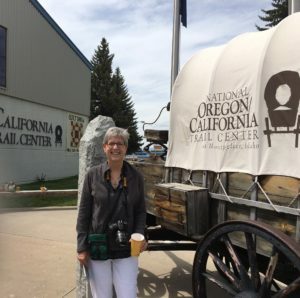 At Montpelier, Idaho, we stopped at the National Oregon/California Trail Center. I had read the 2015 book by Rinker Buck, who retraced the tracks of the pioneers in a custom-built covered wagon drawn by mules. Sue and I were two of six in our group given a white cloth – which turned out to mean we died along the way. 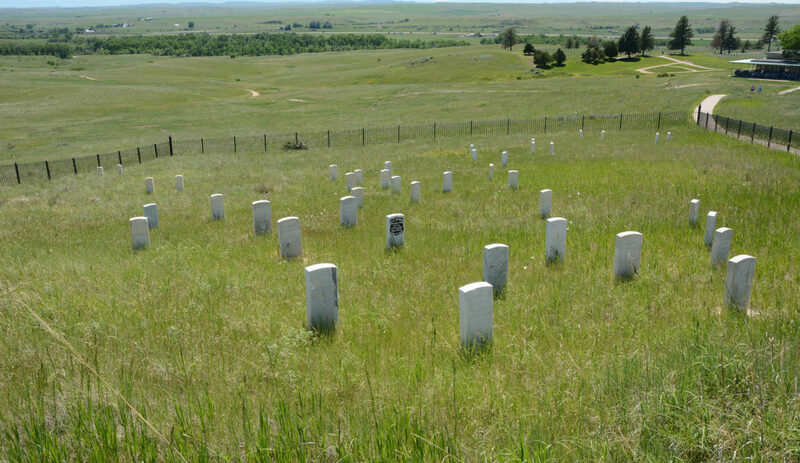 Before we became “prairie angels,” we were jostled in an actual wagon while listening to recollections of trail life. It was folksy, but our group seemed to enjoy it. The trail center helps revive your very faded and patchy childhood memories about the incredible sacrifice and struggle of those who made the decision to take their families west for a variety of motivations – free land, a restart from financial ruin, and escape from religious persecution, in the case of the Mormons. After lunch at Lava Hot Springs, we continued into Utah and Salt Lake City. At Temple Square, some very earnest LDS missionary “sisters” gave us a tour with a lot of proselytizing mixed in. The trip was winding down, giving us time to reflect on the experience. 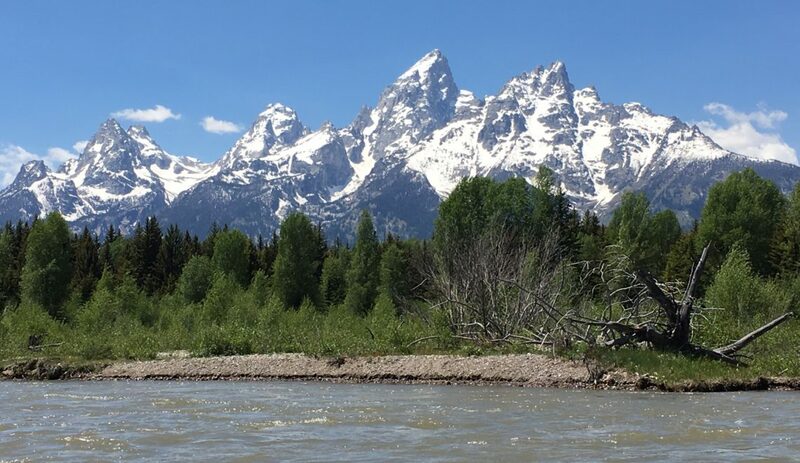 I knocked four places off my bucket list: Mount Rushmore, Little Bighorn battlefield, Yellowstone National Park, and Grand Teton National Park. Also, I added three states to my 50-state quest, bringing the total to 45. Sue added six states to her repertoire. Sue got tired of endlessly climbing on and off the bus and waiting in line to go to the restroom at “comfort” stops. As someone who values photos over T-shirts as the most faithful souvenirs, I was frustrated by the lack of ability to just stop, jump out and focus when an elk in velvet appeared or an amazing vista unfolded in front of us. That occurred approximately every 2.3 minutes in Yellowstone. Taking pictures through glass while moving will not produce the highest quality recollections. Still, I would try it again depending on the itinerary. I read several books in preparation for the trip (see below), and this one had it all – American history, Native American influence, geology, wildlife and some of the most incredible scenery our country has to offer. Travel is healthy for the soul and the intellect. As someone who lives on the East Coast, this trip helped me understand the proud, sometimes defiant independence of the west. It’s very hard out here in this vast land to relate to faraway bureaucrats in Washington and their pronouncements about how westerners should manage their land and live their lives. 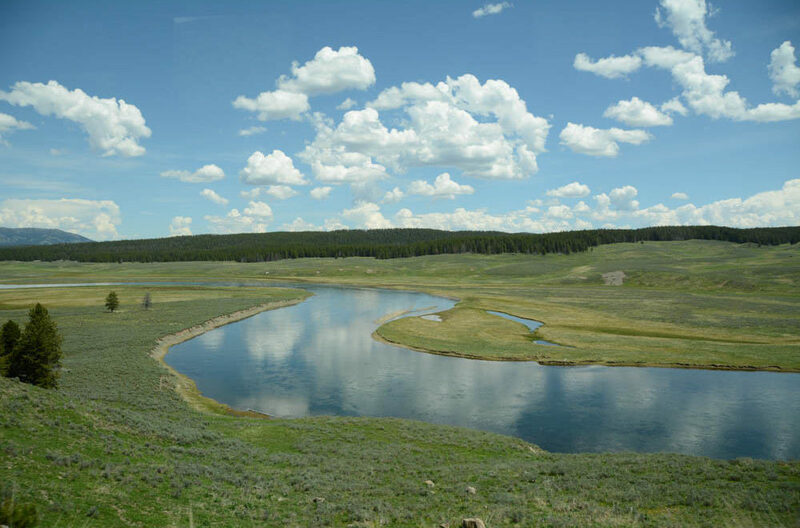 That distrust can clash with federal decisions within the national parks to let naturally caused fires burn themselves out, reintroduce wolves, and strictly regulate the cutthroat trout fishery. Both within and outside the bus, travel is the most inspiring and effective way to learn about and understand each other. So happy that I found your blog. My mom and I are on the fence about taking this trip. It sounds great but like you I love the photos. I think this trip is probably the only way to get into the major places easily. What do you think, knowing what you know now about the trip, would you have taken it? Caravan is not as luxurious as, say, Trafalgar or Tauck. It’s all about the guide and the driver, though. Ours were great. We will probably take another Caravan trip. We went to Utah by ourselves last year and are taking a Road Scholar trip to New Mexico this year. 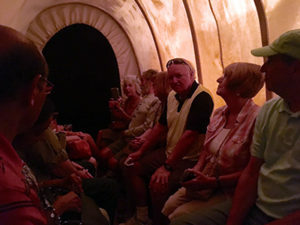 As I said in the posts, there are pros and cons about taking a guided tour.